You are currently browsing the tag archive for the ‘Zealotry’ tag. I’m always on the look-out for smart brands. Brands that bring something new to the table or brands that do an amazing job engaging their Zealots. When I first stumbled upon Warby Parker I knew they were someone to take note of. WP is a vintage-inspired eyeglass company based in New York City, known for their online sales program. While selling eyeglasses online doesn’t seem like the smartest business model, WP has thought it through. As a potential costumer, you simply pick out 5 of your favorite frames and WP ships them to your home for free. Your instructions? Wear one pair each day so the people who see you the most can give you feedback. Then, pack all 5 frames in the box and mail them back – shipping covered by WP. If you found a pair you like, simply order that frame with your prescription and the glasses will be custom-made for you. Sounds like a pretty pricey product, right? Not at all. Each complete pair of glasses costs $95. Plus, for each pair purchased, one is donated to someone in-need. Talk about making your customers feel good! 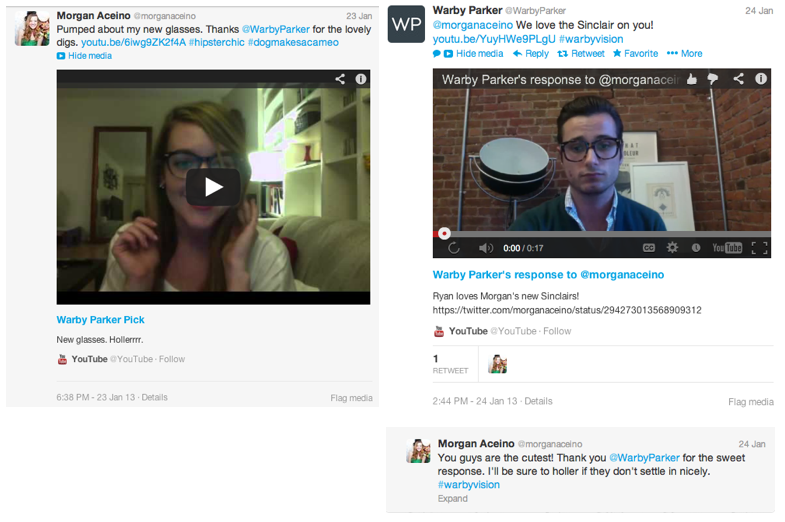 Warby Parker has a strong social presence – both on and offline. 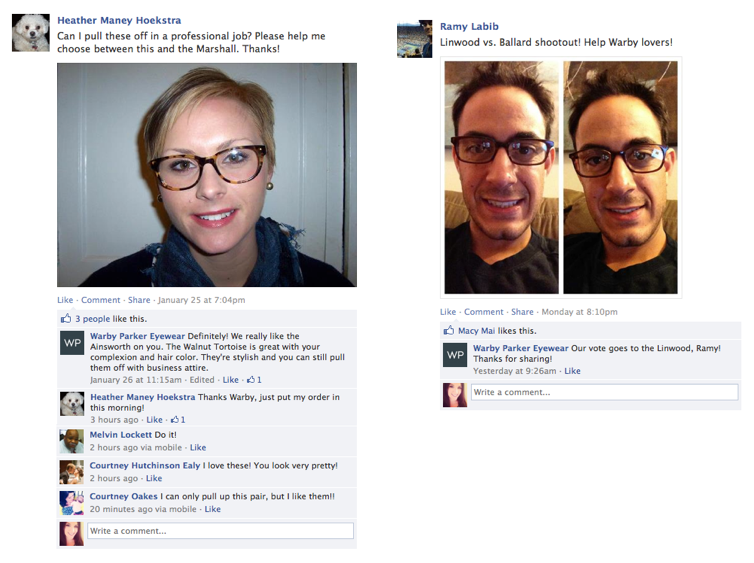 When WP sends your Home Try-On kit, you’re encouraged to share pictures on the Warby Parker Eyewear Facebook Page. So not only can you to get feedback from your friends, but you can get feedback from the WP community as well. For those of you addicted to 140 characters, give WP a Tweet. Even with an average of 3592 Tweets to @WarbyParker each week, they do an amazing job of interacting with their followers. Here’s my friend’s interaction with WP. In fact, it was her posting on Twitter/Facebook that first introduced me to the company. See? Engaging your Zealots truly pays off. WP has also thought about their more traditional customers, making their frames available in 12 showrooms across the US as well as on the traveling Warby Parker Class Trip. Visiting 9 cities over six months, this school bus full of frames is touring the US, with members of the WP team posting pictures of their journey along the way. Simply put, this campaign it’s buzz-worthy and fun. After all this research about Warby Parker, I think it’s about time to get a new pair of glasses. Stay tuned. Much is written about dealing with customers at the front end of a relationship or transaction. Now there is evidence that an open and liberal return policy also has a tangible payback. Most people have a built-in “radar” to detect how someone feels towards them. Seemingly insignificant words or gestures can have a large impact. For example, with a return policy based on the goal of minimizing fraud, customers will emotionally detect that they are not trusted. Conversely, if the company’s underlying assumption is that customers are honest and fair – and that when they need to return something they have a genuine problem – then their policy will make customers feel cared for and valued. A research study recently published in the Journal of Marketing reflects the longer-term financial impact of return policies. And it’s not good for those strict policies. Customers who paid for the return of a defective or unwanted items decreased subsequent spending at that retailer by 75 – 100%. On the other hand, retailers who offered free returns to their customers saw subsequent spending by those customers at 158% – 457% of pre-return levels. Short-term actions have long-term consequences to your Zealots. Zealotry actions should demonstrate ongoing “appreciation” to customers. Let’s think about typical marketing examples that do just the opposite. Nickel-and-dime charges. Fine print exceptions. Exaggerated promises. In every research group we’ve conducted, participants voice their disdain over such practices. If the goal is building loyalty, ignoring these fundamental issues while spending heavily on so-called loyalty programs is not only wasted dollars, it is counter-productive. Guest Relations Marketing has long advocated a more personal, authentic and cost effective approach to igniting your “Zealots.” Coming in January, we will be launching a program that any company can implement. An authentic alternative to traditional loyalty programs. One that builds loyalty the right way. Stay tuned for ZealStorm. Get ready to ignite your Zealots in 2013! “Zealotry Marketing” is about creating programs that have a primary goal of generating referral. If referral is the best indicator of long-term profitability, then it made sense to us to use that as the starting point for creating marketing programs. Not merely looking at referral as an indirect end result. This has led us to a revolutionary perspective on blending the classic marketing principles with today’s hot social media. And, heresy for old-school practitioners – the idea that the most effective marketing may well come from operations and service delivery. This is the story of Zealotry Marketing: where loyalty begins with a company exceeding a customer’s expectation. An approach that can be engaged through any company and doesn’t require so-called marketing pros. It does require a sensitivity and commitment to exceeding customer expectations. Guest Relations Marketing believes Zealotry Marketing transforms the traditional loyalty equation. What are you doing to create Zealots? “I don’t need 15 or 20 customers coming in my store. I need 100s.” A retail store owner explaining why he was dropping our program. It was then I realized I was a reformed ad guy. I was fighting for a targeted marketing program for this upscale niche retailer. And, he wanted a mass media ad program. In a former day, I would have delighted in his words and been excited to create such a program. Instead, that was the moment I realized I had truly gone to the “other side.” To Zealotry Marketing. He wanted faceless bodies. We wanted to build passionate supporters – Zealots. And, what he wanted was not the right answer. Respectfully, I said “No. The right 15 to 20 ‘guests’ will be better for your store.” He shakes his head in disdain. We shook hands and departed. Last I checked, his mass “numbers” approach had not helped his store avoid treading water financially. So, much for the short term solution. There are very few quick fixes in marketing. Most mass media campaigns do not return a positive ROI. Most referral-based programs do. It’s simply a matter of when. At heart, great brands deliver a distinctive experience that is personal and can motivate referral. Zealotry Marketing is about creating programs and touch point channels that encourage such referral. And, mass media can play a role. Whether it is communications, service or product, when the program focus tips to mass versus personal, the ability to create Zealots diminishes. The basis of referral is a one-to-one action. The basis of creating a sustainable referral program is Zealotry Marketing. It’s not a quick fix. But, it is a sure, and profitable fix. I’m about creating winning programs. Maybe, that’s why I’m a self-confessed reformed Ad Man. Seen at an local indie coffee house – a blackboard wall that people write their favorite sayings/graffiti – quite interesting! Contrast that … at a Starbuck’s – a similar blackboard wall with chalk writings – which upon further reflection are all about how great Starbuck’s product is. In other words, it was a fake graffiti wall carefully written by Starbuck’s. So much for “organic” … or authenticity. What happened to the Starbuck’s that focused on experience and not constantly selling you? Another big brand gone bad? Let’s just get this straight once and for all: There is no such thing as brand loyalty. Each of us likes certain brands and may even love them. We may buy them most of the time, or perhaps even every time. But the idea that we have a true bond with any brand, like the kind of commitment we have in real life with our friends and family, is a farce. This doesn’t mean we shouldn’t try to create that kind of loyalty; most of us tell ourselves that’s the end game and it’s always important to aim high. What it does mean is that we should take a harder look at how we go about creating what we call loyalty. We need to admit that coupons, discounts, points and prizes are just beanbags. We ought to spend more time thinking about the stuff that really matters to people, and serve that up each and every day. That means products and services that really and truly solve problems and help people live happier lives. Providing a helping hand when someone really needs it, and smiling because we truly mean it. It’s not because the customer is always right (nobody’s perfect). It’s because it’s up to us to make it right. We may not get the same kind of loyalty we enjoy with our family and friends, but we’ll have more fun, and so will everyone else. Loyalty is what we make it. Your thoughts? ~ Tim Manners, editor. Is Zealotry About Business Growth? It finally hit home for me. Well, Stan Stainaker of Hub Culture, writing in the Harvard Business Review bloglines has reaffirmed my commitment to Zealotry Marketing. Stan talks about the idea of regeneration instead of growth at all costs. He notes that processes, capabiliites and new offerings are another way of growth. And, like cells, some die away, while others grow or prosper. In fact, isn’t that what zealots want to hear? They don’t care that you are growing at all costs. They care that you are nurturing, expanding and delivering on those points that are vital to why they are zealots in the first place. So, redefine growth. Think “regenerate”. Regenerate your business consistency around your most passionate customers – your zealots. They will get the word out. A startling example of the effect of being relevant and engaging in social media. But, get this! The musician who owned the guitar took his story to song (and a YouTube video) when United didn’t respond to him in a timely manner. In his own way, this musician parodied the whole story in song – a less than flattering portrayal of United’s baggage handlers and service reps. The views to his video: 5,005,000. That’s right. More than 5 million viewers. Comparison point? CBS Evening News averaged about 6 million viewers for 2008. My Name is Earl – season-ending show last May drew about 4.8 million viewers. Imagine … getting your gripe (or plaudit) across to as many viewers as a network evening broadcast? People watch and read what interests them. Even on-line.